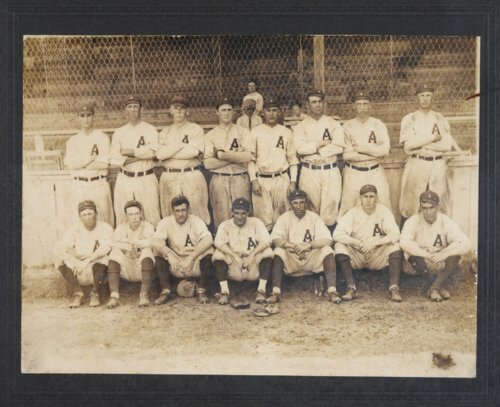 This photograph shows the 1913 Austin Senators baseball team of the Texas League. Standing second from the left in the top row is Wiley Taylor, a right-handed pitcher from Louisville, Kansas. Taylor played three seasons in Austin, where he compiled a 51-47 record for the Senators, including a 22-14 season in 1911 as he helped the team secure the Texas League pennant. He also pitched in the majors. He had trial outings with the Detroit Tigers and the Chicago White Sox, but most of his major league games (21 of 27) were with the St. Louis Browns, where he played in 1913-14. Taylor's major league record was 2-10, with an ERA of 4.10. After his baseball career, he remained in Pottawatomie County, where he farmed and served four terms as the county sheriff (1925-28 and 1945-48). Late in life, he also ran a service station and recreation parlor in Westmoreland. Wiley Taylor died at the age of 65 in 1954. A complete listing of the Senators pictured in the photograph includes: (top row, standing, l to r): Tulane McCuller (p); Wiley Taylor (p); Mike Flanagan (p); Bert Larsen (p); Harold Thomson (2b); Otto McIvor (cf); Fred Brainard (if); and Luther "Doc" Cook (rf). Seated in the front are (l to r): Ben Brownlow (ss); Chester Bobo (c); Eddie Hohnhorst (1b); Leon Lewis (p); William Hille (3b); Harry Haigh (c); and Bert James (lf).